This view is one of the first from the MESSENGER probe's Oct. 6, 2008 flyby of Mercury. The bright crater south of the center of the image is Kuiper, identified on images from the Mariner 10 mission in the 1970s. For most of the terrain east of Kuiper, toward the limb (edge) of the planet, the views are the first ever of that portion of Mercury. A NASA probe has begunbeaming back stunning new images from its successful second flyby of Mercury,the planet closest to the sun. NASA's MESSENGER probecaptured never-before-seen views of the Mercury during its encounteron Monday. The spacecraft zipped past Mercury for the second time this yearand used the planet?s gravity to adjust its path as it continues en route tobecome the first probe to orbit the planet in March 2011. One new image shows largepatterns of ray-likelines extending southward across much of the planet surface from a young,newly-imaged crater. The previously-imaged Kuiper crater and others craters alsohave similar webs of lines radiating outward. Another raw picturerepresents the highest-resolutioncolor image ever taken of Mercury's surface, and came just 9 minutes afterthe spacecraft's closest approach to Mercury at 4:43 a.m. EDT (0845 GMT).Details include a large impact basin with an 83-mile (133-km) diameter, namedPolygnotus for a Greek painter from the 5th century B.C. Yet a third first-time imagecame from MESSENGER's approach to the crescent-shaped Mercury, and is oneof 44 pictures taken as part of a mosaic. Scientists hoped to collect nineimage mosaics total in order to add up to 30 percent of never-before-seenregions of the planet's surface. The second Mercury flyby ofOct. 6 comes after a firstflyby on Jan. 14, which looked at a different side of the planet. "When these data havebeen digested and compared, we will have a global perspective of Mercury forthe first time," said Sean Solomon, MESSENGER's principal investigator atthe Carnegie Institution of Washington. 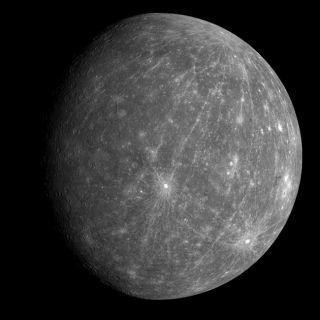 Launched in August 2004,MESSENGER — short for MErcury Surface, Space ENvironment, GEochemistry, andRanging — is the first spacecraft in 33 years to greet Mercury up close sinceNASA's earlier Mariner 10 mission of the 1970s. The new probe is slated for athird Mercury flyby in 2009 before finally settling into orbit on March 18,2011. MESSENGER?s $446 million mission is expected to spend about a yearstudying Mercury.